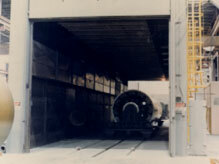 Provided to a major aerospace contractor, this CART TYPE BATCH OVEN, is used to cure graphite composite structures. It is a (1) one zone, gas fired oven, capable of processing 18,000 lbs. per hour (combination cart/product). In this installation, the customer already had a cart and track system for moving their products. We provided an oven to fit in their available floorspace. The door openings are 10 feet wide X 9 feet high. The approximate overall dimensions are 61 feet long X 14 feet wide X 17 feet high.